There were 16 people in front of me at the “King of Cable” (also known as Xfinity and before that, the beloved Comcast). I knew it would be a long wait, so I hunkered down along the wall with many of the others who were looking to cut their cable. Some carried their equipment in bags (like myself), boxes and others – just naked. Although they were trying to avoid it with their swanky look and feel – the place felt like a DMV with the waiting screen mounted to the ceiling and disapproving faces abounding. “We are finally going through with this,” I thought to myself, somewhat excited and relieved to start saving more money per month, sans cable. I printed out Xfinity’s largest competitor’s price for internet from their website (much less than what we were paying with our “bundled” services) – and was hoping to strike a deal with the representative. Unfortunately, we had a 2-year contract with the King which wasn’t going to be met. All total our “early termination” fee would be about $60 and I’d already tried to get that fee reduced over the phone with another representative. They weren’t budging. And, I wasn’t going to contest it now. I knew about this fee when I negotiated a reduction in our cable bill two years prior. After about 30 minutes, my name was called and I approached the counter. The representative was respectful and courteous. Within 5 minutes, he canceled my cable and phone, and said they could offer a price that was about $10 above the competitor’s price (about $15 less than what I was paying with the “bundled” service). I thought that was fair. All total, we’ll be saving about $1,200 per year without cable. Not bad! Well worth it for the savings and time we are getting back. I should say we are planning to pick up Netflix or Hulu Plus, which will tack on another $8 or $12 per month. So that will cut into the “savings” some. This cutting the cord has definitely got me inspired to consider more ways that we can live more simply. It’s also made me look at “bundling” in a new way. I’ve always considered bundling to be a cheaper alternative to a la carte. But this is becoming less true with all the other alternatives out there for customers. Take your landline for instance. While some are ditching them altogether for a cell phone, many (like my wife) need the landline for faxing and other purposes. With Ooma, we’ll only be paying about $5/month (which are taxes/fees) for our landline. And if you really wanted to keep cable, you could opt for DirecTV, which you could get for $20/month. Then with internet, many providers have great deals for new customers depending on the speeds you need. Have you ditched cable and what has your experience been? I thought the same thing about DirecTV too, that it was $20 a month. They do have zero or at least way fewer crap fees too, since they use no infrastructure. However, that $20 a month is only for the first two years. It’ll creep up after that. We’re paying $80-something a month at the moment with no premium channels. We cut cable & I really don’t miss it at all. The only reason we got it in the first place is that the d**ned over the air stuff went away when the signal went digital and all we had was an old analog TV.. SO we upgraded our TV and got a very good antennae from Amazon and now we have our over the air TV back and din’t miss cable at all. We still have the Internet/phone bundle but I will check into Ooma so maybe we’ll only have to keep the Internet service. If it were up to me, I’d ditch phone entirely and just keep a cell for the very occasional phone calls I make or receive. I’m just not a phone yakker. And anyone that needs to reach me M-F 8-5 can call my desk phone at work. I think we keep the land line mainly so my housemate’s elderly mother can easily reach him. We have Comcast but FIOS may come in soon and maybe we’ll get a bundle on that. Or not. I hope Google or other services will be available for high speed Internet soon. Cut cable? But how could I watch Downton Abby? Oh, I could watch it online! Hi, we as a family are NOT ready to entirely cut cable/sat services. I know we could be paying less for internet under Comcast and less for sat – under DISH but that is our only entertainment –unless I get a freebie like I did for 4 free tickets to SeaWorld with free admission to the Acquatic water park section. We only had to pay for a hotel and parking for our mini vacation over Labor Day holiday. When kids get older and into other activities, then we may cut out some tv services..thanks! I thought the same thing Tracy – it is essentially one of our only “splurges” for entertainment too. But after weighing it all, we decided to cut. I use XM satellite radio to get my cable news fixes; I love both CNBC and Fox News. Also love the music channels on XM. Still have the internet through Comcast (all that is available in my area), but am very pleased with the smaller bill. Welcome to the club! When our internet/cable bill grew to about $150/month about five years ago, we cut the cord. I was in grad school, so it wasn’t a big deal for me–I was plenty busy. It was a little harder for Garrett who enjoyed premium cable shows. 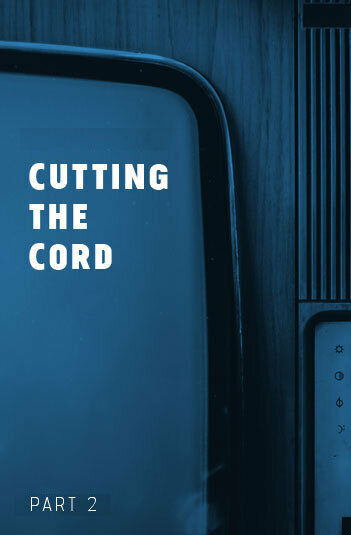 With so much media available via Netflix and Amazon, cutting the cord is a lot easier today! Thanks Claudia! Wish we’d done it sooner..